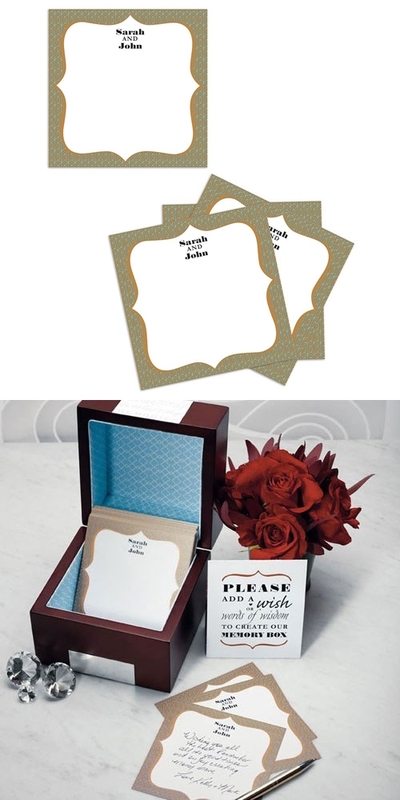 These "Well Wishing" double-sided cards offer a contemporary alternative to the traditional guest book. Each order includes an instructional tent card. The cards may be personalized with three lines of custom text or a couple's monogram (the order is Bride's first name initial/Couple's last name initial/Groom's first name initial). The pictured wooden Memory Box is not included but available separately as Product Code: ER-9162. PLEASE NOTE: Sold in a set of six (6) and prices quoted below are per set. Due to personalization, the minimum order quantity is four (4) sets of six (6).